If you have a specific date in mind for your wedding, this is an important first question to ask any potential venue. Don’t waste your own time touring or going further in details if the date or dates you want to host your event are already booked. If you don’t have any specific date in mind, ask what dates are available in your season of choice. If you are on a budget, ask if there is a time of year when the rates are discounted. You may be surprised and fall in love with an unexpected date! 2. Can you hold my estimated guest count? The second best question to ask a potential venue is whether or not they can hold your expected guest count. If you’re planning to host a 700 person event, but your space only holds 600 guests that is an easy way to narrow down your selections. Also, the number of guests who will respond yes is approximately 12-15% less than your entire guest list. Many venues have a variety of space available for each guest count, so it’s best to verify what space would fit best and its availability. 3. What is the average cost for my guest count or per person? Budget is always a crucial factor for every event. Find out if your potential venues are within your budget by asking for a range of costs for your guest count or a range per person price. This will give you an estimate on the low and high end before even selecting any options. 4. May I come in for a tour? Try it on before you buy! Coming in for a tour of the space is just as important as trying on your wedding dress before the wedding. You wouldn’t want to purchase a space without ever seeing it or “trying it on” to see if it matches with your style and vision. See when your venue offers tours, a personal tour is always best. On the tour you will be able to see all available rooms, meet the venue staff, and get all of your questions answered. 5. May I see any photos of past events? Seeing past event photos in the space you are considering for your event is always a bonus! 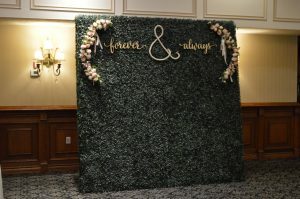 Viewing photos will get your mind going on unique ways of decorating or laying out the venue space you might not have even thought of before. 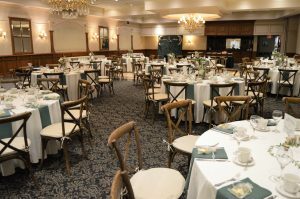 Seeing prior work will also give you an idea of the venue’s quality, style, and reputation. 6. Good food and menu options are important. 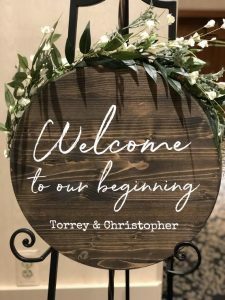 The food is more than a meal, it’s an opportunity for family and friends to share conversations, ideas and connections and to celebrate your special day. Putting extra thought into your menu allows for extra enjoyment and is an expression of your personality. Be creative! 7. Are there any specials available? Who doesn’t love saving money? It never hurts to ask if there are any specials happening for your potential wedding or event date. 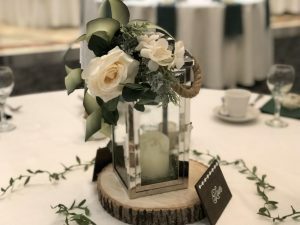 Many venue spaces offer seasonal specials or packages throughout the year, specifically for last minute or off season events. If you and your partner are flexible on the date, this can be a huge budget saver for you! 8. How much money do I need to secure my date? If all of the above questions check out and you think you may have found your dream venue, the final thing to discuss is payments and deposits. Check to see what your venue’s policy is with reserving space and services, if there is a deposit fee, and when additional payments are due. It is always best to book a date as soon as you’re able to put down a deposit, before anyone else falls in love with your space and date too!